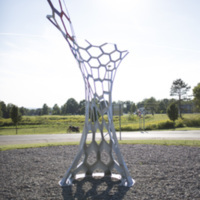 Osman Akan, “Nano,” Art Oneida, accessed April 20, 2019, http://artoneida.org/art/items/show/203. 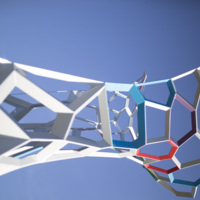 Description: Artist Osman Akan was fascinated by the hexagonal forms of carbon nano structures that cannot be seen by the naked eye. 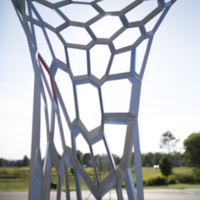 For his sculpture Nano these forms are enlarged to a scale that commands our attention. 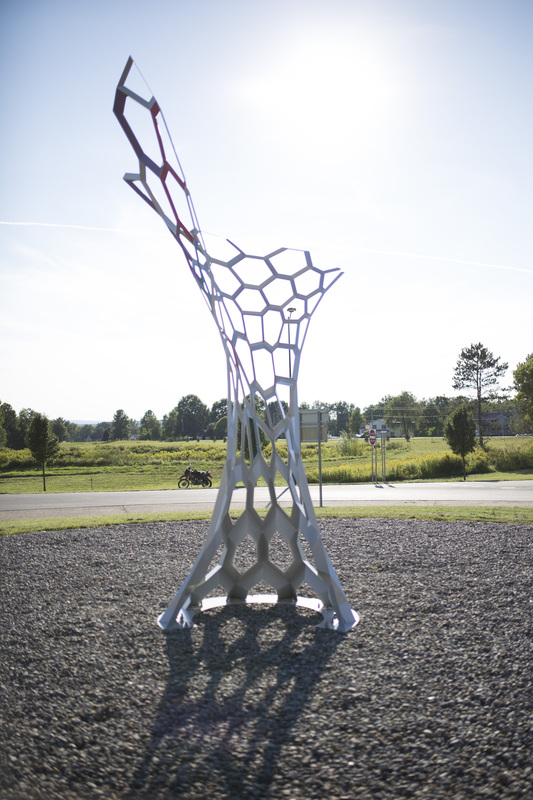 The work explores the science and the ability of manipulation possible at nano-scale. 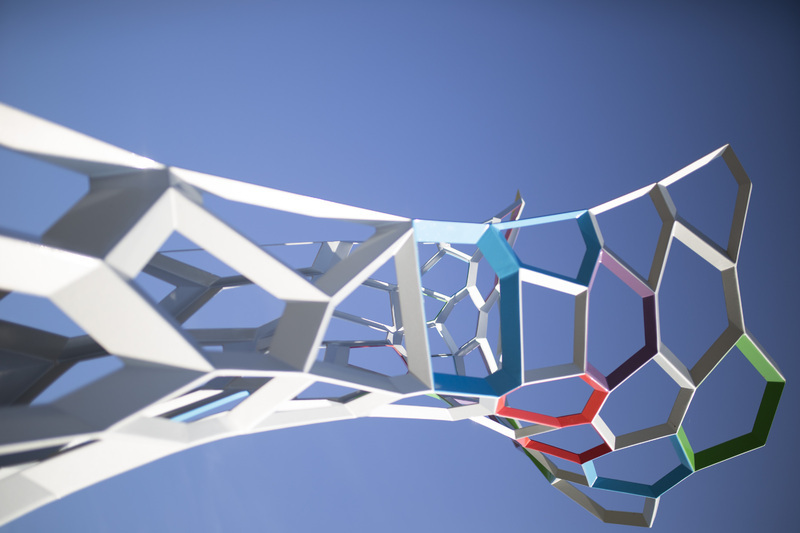 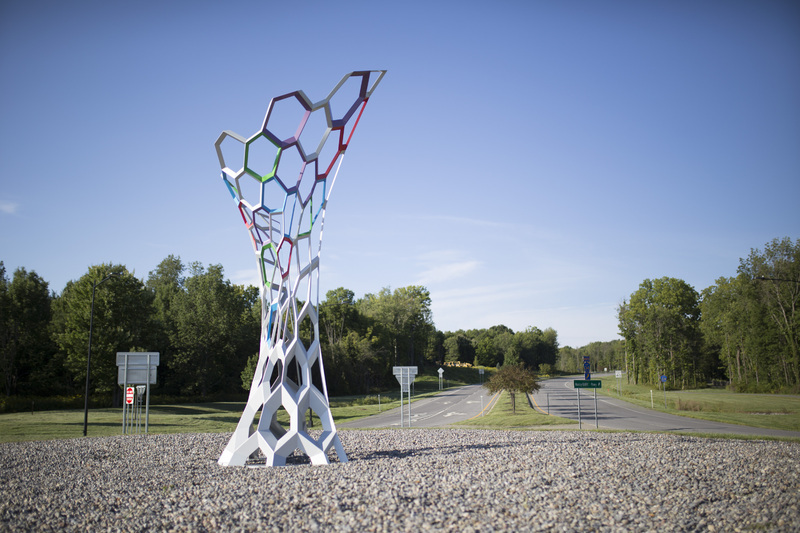 Versions of the hexagonal shapes join together, shifting and scaling as the piece gets taller. 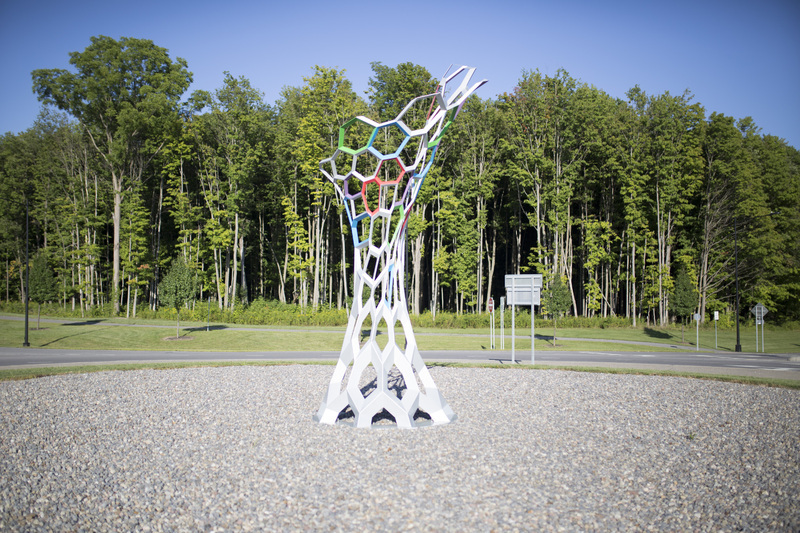 As the sculpture rises from the ground, an interplay between the convex and concave appears. 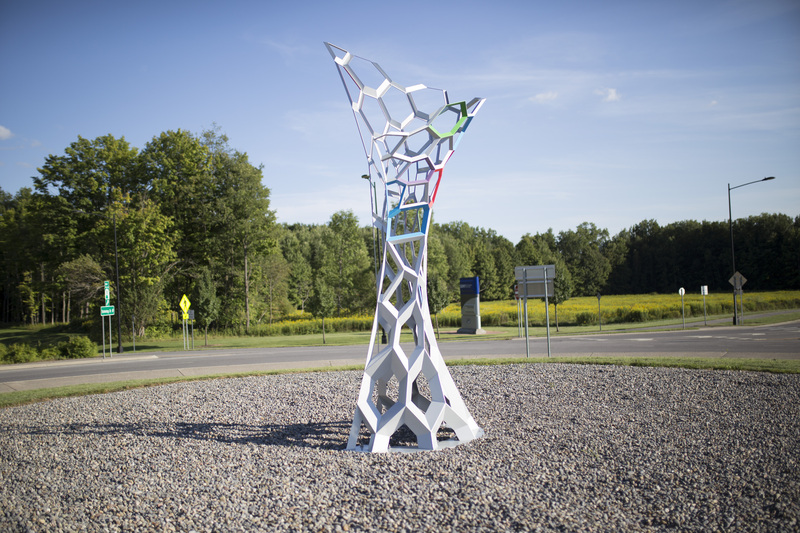 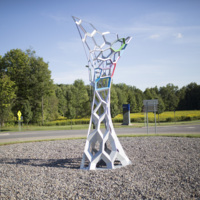 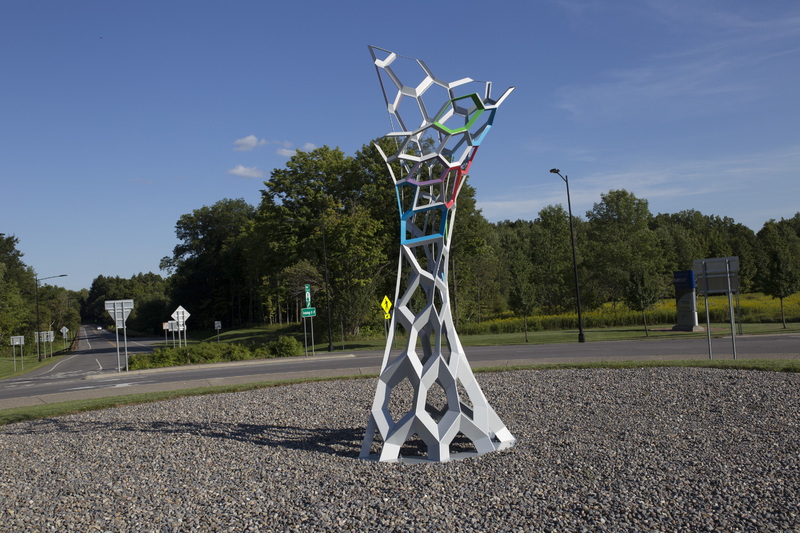 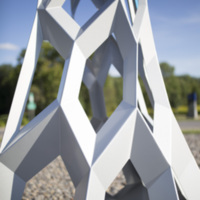 Commissioned in 2013 by Sculpture Space, this sculpture was funded by Mohawk Valley EDGE. 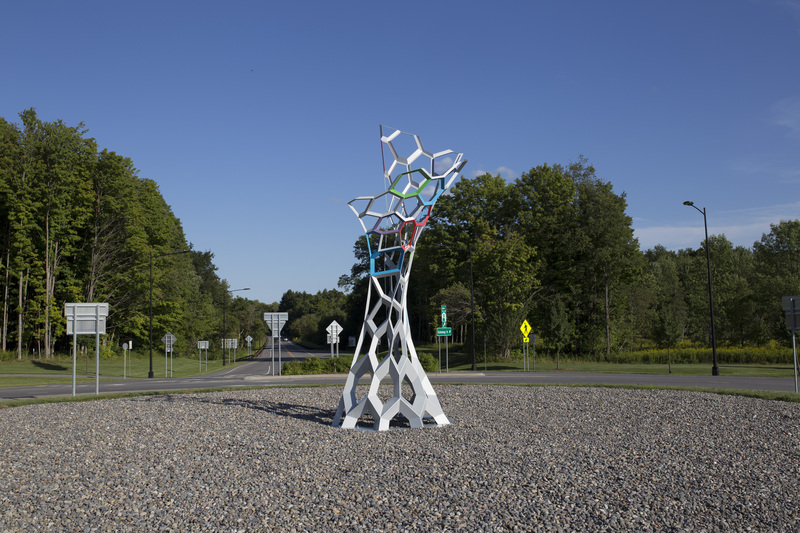 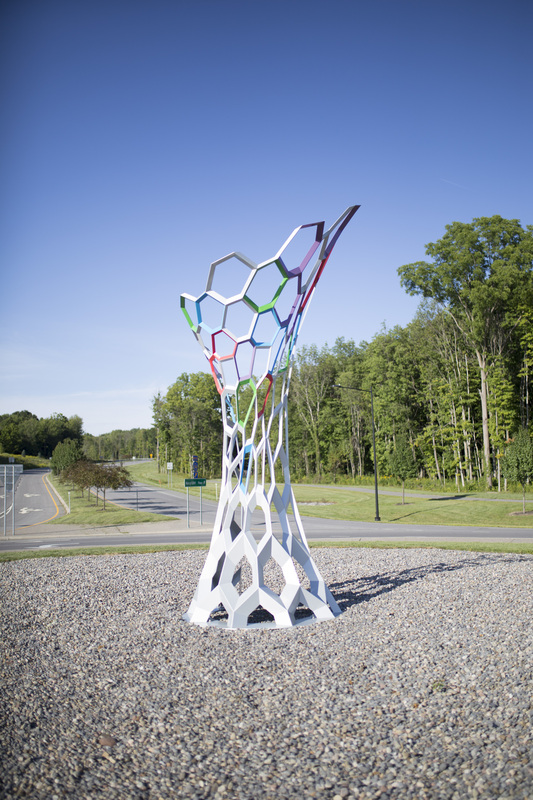 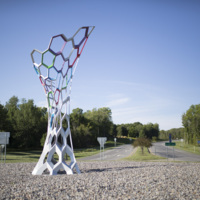 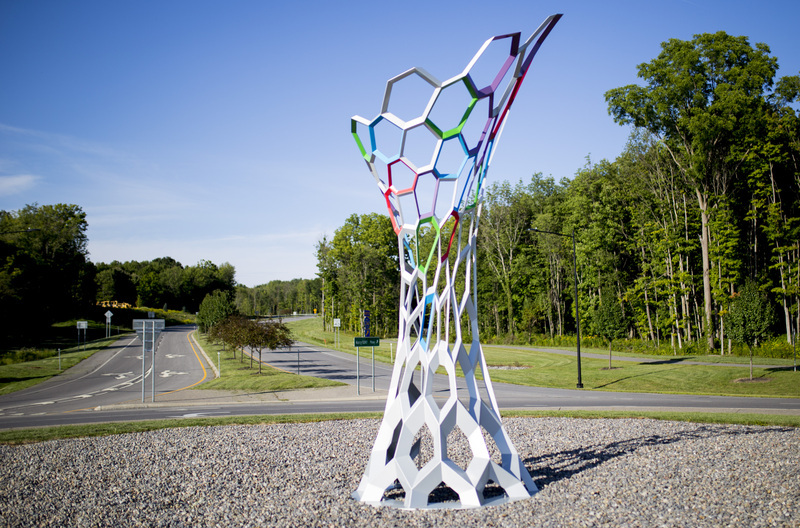 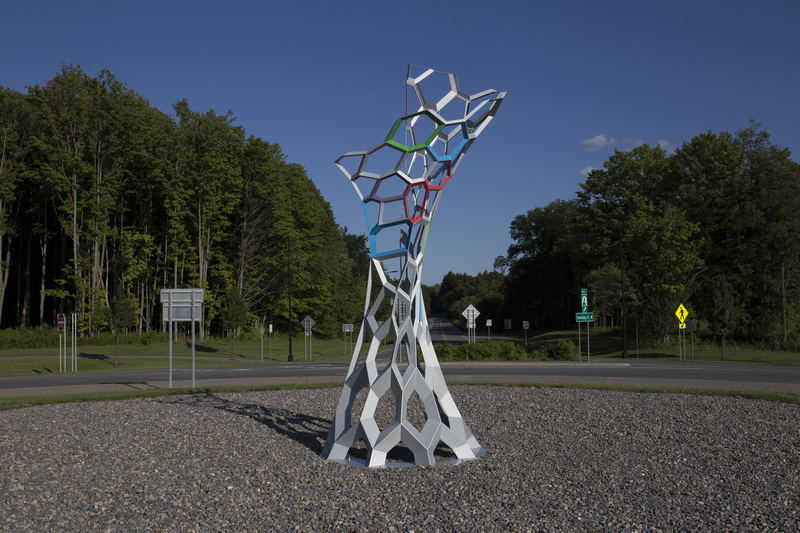 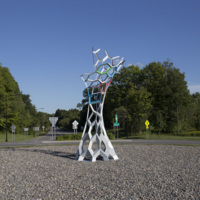 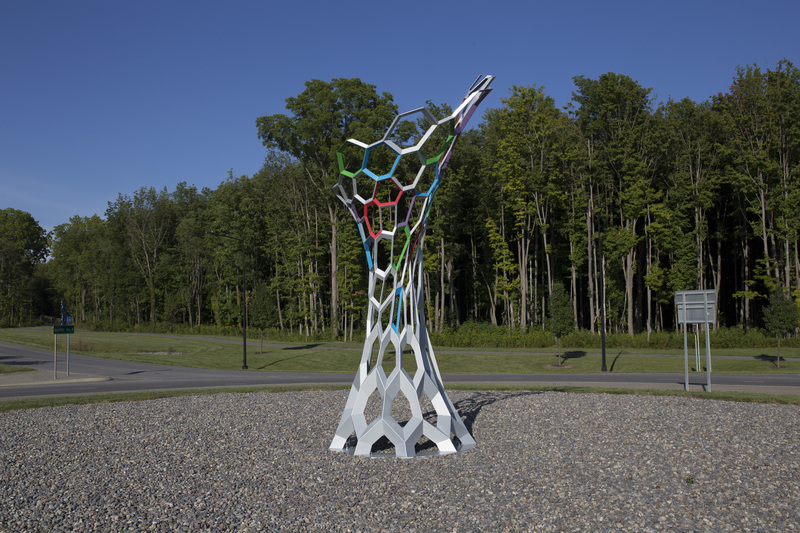 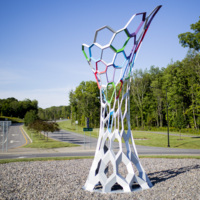 It was installed in 2014 facing the main entrance at the new Nanocenter at the SUNY Institute of Technology in Marcy. 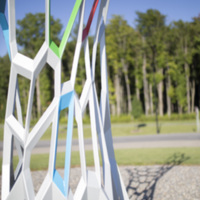 Characteristic to his mode of working, Akan modeled the artwork in 3D software. 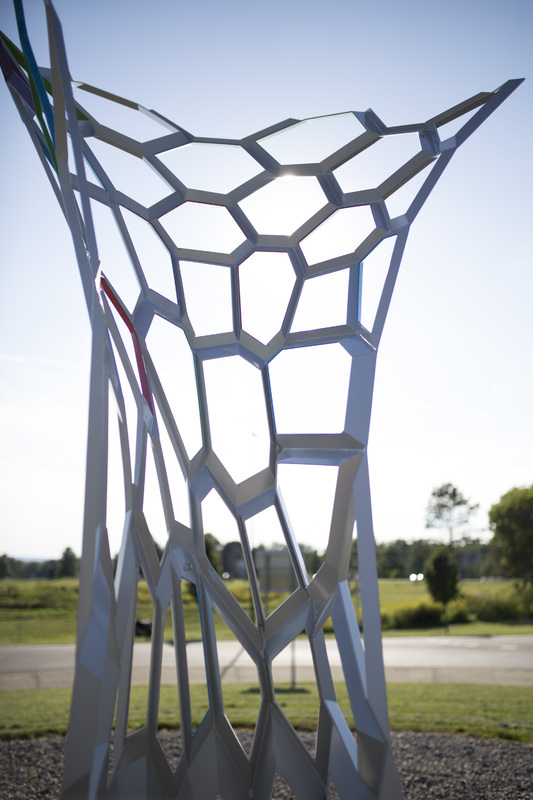 For the full scale form, thin carbon steel sheets were carefully calculated, laser cut, and welded so that the angles within each cell give the form strength and load bearing capacity. 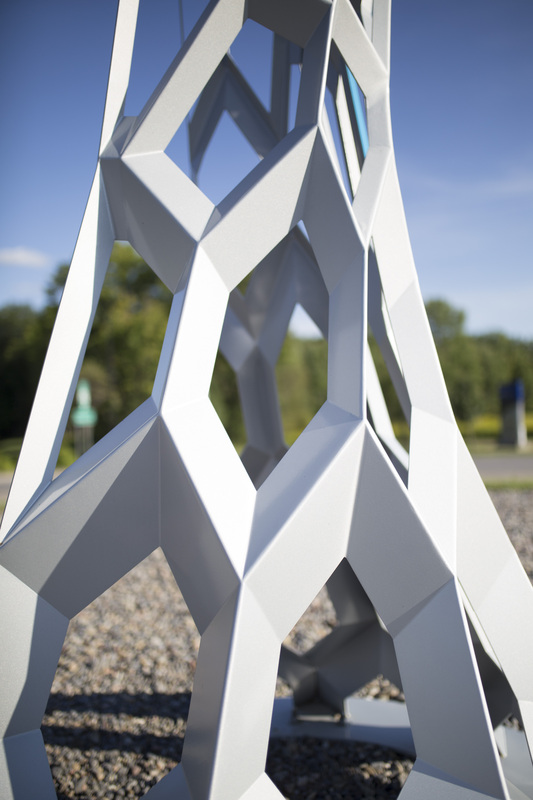 Metallic paint reflects the changing light in the environment, adding to the sense of a shifting form. 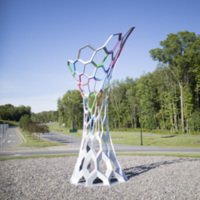 In fact, the professional coatings used in painting the sculpture are manufactured to include nanoparticles. 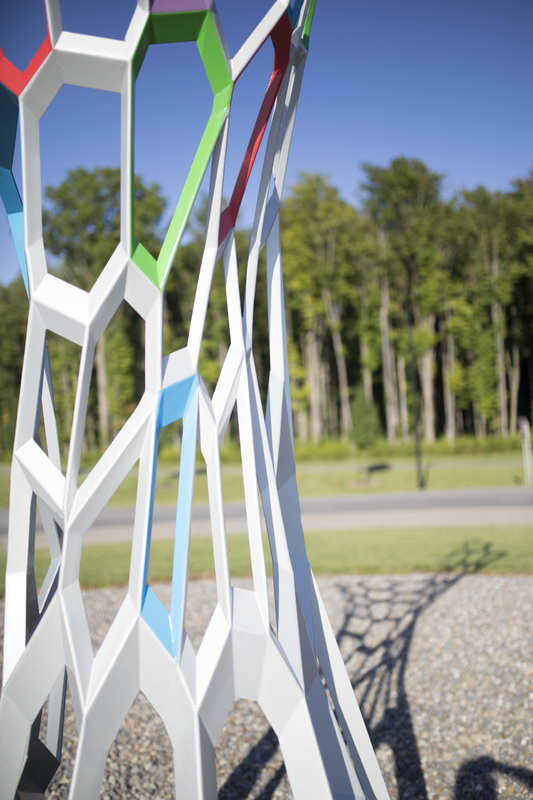 Walking around the sculpture, each separate view is a different perspective of light, form, and the surrounding environment.